A conversation with a friend in 2013 changed the course of Kristen Babcock’s life. During the eye-opening discussion, the busy mother of three found out about code blue shelters and the dire need to assist the people who seek refuge in them. Once she learned about the statistics and shortage of supplies, she felt she had to get involved. More than five years later, what began with leading a single blanket drive has blossomed into launching and operating the Code Blue Collaborative non-profit organization with multiple volunteers and projects—and she is looking for ways to expand. The designation ‘code blue’ refers to temporary homeless shelters that only open when the temperature drops below 25 degrees or there is another kind of life-threatening weather event. What Kristen discovered, and many aren’t aware of, is that there are only a few state-funded ‘code blue’ shelters in Burlington County. Each of those temporary shelters, typically set up in churches, can only house about 14 people at a time. They provide a great service, but there are currently over 2,000 homeless individuals in Burlington County and the need for assistance is far greater than the system can accommodate. Kristen set out to help stock the existing shelters, and then began to look for ways to make a wider impact. 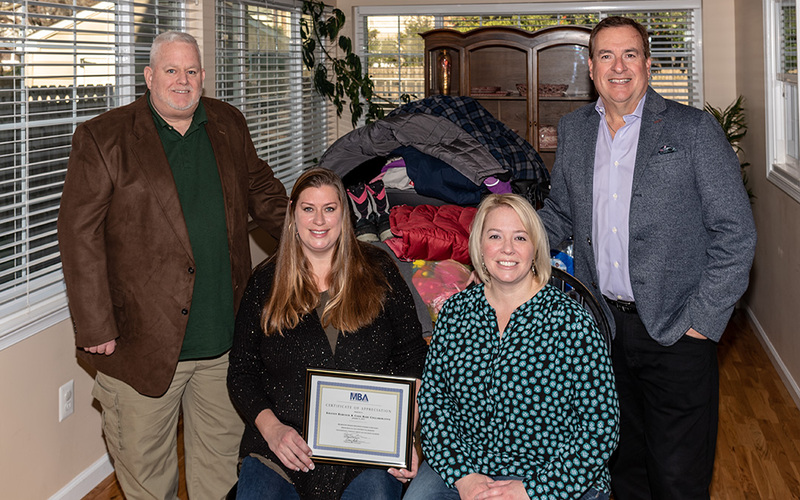 Looking to make the donations more accessible to those in need, Kristen developed a relationship with a permanent shelter in Mount Holly, operated by the Extended Hand Ministry. When she realized there was a need to build funds to purchase supplies and furnishings, Kristen decided to form a non-profit organization to ensure transparency. She established Code Blue Collaborative in 2016 and formed a board to administer to the details. The Mount Holly shelter is also a food pantry that helps families in need with supplemental groceries in addition to aiding the homeless. That led Kristen to begin an ongoing food drive, along with regularly collecting blankets and clothing for that shelter and other sites. Four years ago, Kristen’s daughter Hannah successfully started a toy drive for the families aided at the shelter, and that idea has expanded to an ‘adopt a family’ program in which Kristen connects sponsors with recipients. Kristen also facilitates a late-summer school supply drive and an annual fall turkey drive in partnership with Extended Hand. In cold weather, the focus of Code Blue Collaborative is to build a reserve of blankets and warm clothes for distribution. In warmer months she also collects other items, such as toiletries, socks, diapers, and baby formula. Kristen makes deliveries of the donations four to five days a week to the Mount Holly location and other area shelters. With an overflowing basement, Kristen projects that the next step will be to secure a storage facility to house and organize the donations. She is actively reaching out to area businesses who may have the capacity to share space. All are invited to attend Code Blue Collaborative’s fundraiser on Saturday, Feb. 23, a fun-filled evening that will be held at Lutheran Crossings in Moorestown from 7:00-10:00 p.m. For information about the event, or to donate to or volunteer for Code Blue initiatives, visit the Code Blue Collaborative Facebook page or contact Kristen at 484-319-6021 or kristen.babcock@yahoo.com. The Moorestown Business Association Board is delighted to recognize Kristen Babcock and Code Blue Collaborative with a Spotlight Award, acknowledging her exceptional community service and commitment to establishing an impactful non-profit organization.